We will be back in UK waters shortly so underway sampling will start again. Everyone else is starting to pack up their equipment and looking forward to all the analysis of the frozen filters and samples when they get back to NOC. This morning I have been on a tour of the ships engine rooms. There is an entire deck given over to engines, generators, spares, a workshop, and much much more. It was a fascinating tour; it is easy to take for granted the engineering section, but without them we wouldn't be going anywhere! 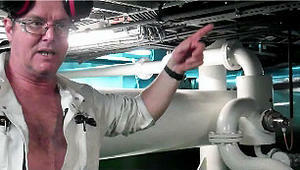 Chief Engineer George Parkinson gave us a stern to stem tour. Tonight we are having a small gathering in the bar, with ships company, scientists and technicians all celebrating a job well done.